I’m a failure. I have and will always be a failure…when I try to be perfect. Perfection is impossible. But why do so many people suffer from perfectionistic thinking? So we THINK we are helping reduce our shame when we try to be perfect, but in reality, perfectionism is like pouring gas on shame because we always come to realize that ‘I’m a failure’. How can you embrace the idea that ‘I’m a failure’ as a healthy way to combat perfectionism? It’s time to be realistic about what you can and can’t do. It doesn’t make you a failure to see that you have limitations in life, it makes you human. Welcome to the club. You may need stretch in this area by vulnerably asking for help, replacing the perfectionistic lies with truth, purposely decrease your standards, and increase your self-care to give you a chance to rest from the warring high expectations in your head. Have you ever felt paralyzed because of all the imperfections around you? Do you have trouble focusing and relaxing when things are out of your control? Has it led to anxiety or depression? If so, it’s time to set yourself free from the impossible standards you set in your head. Equate the perfectionistic thoughts to an abuser who is out to hold your life hostage. Start fighting this enemy with truth that perfection is impossible, so therefore it’s normal that ‘I’m a failure’. Failures aren’t something to wallow in and beat yourself up over. They are opportunities to learn and grow! If we get stuck in the fact that we failed, we’ve missed the chance to see an area to work on. Seeing where you need some improvement helps you navigate goals and helps you become more self-aware about your life. This mindset is a spring board out of a shame spiral and into a place of learning about yourself and growth. It’s time to shed the perfectionistic mindset and embrace that I am an imperfect, real, failing, mistake making human- and so is everyone else. This helps us with the internal war in our minds as well as how we operate with those we love in relationships. Look for a chance today to offer grace and love to yourself and others when someone’s humanness is showing. 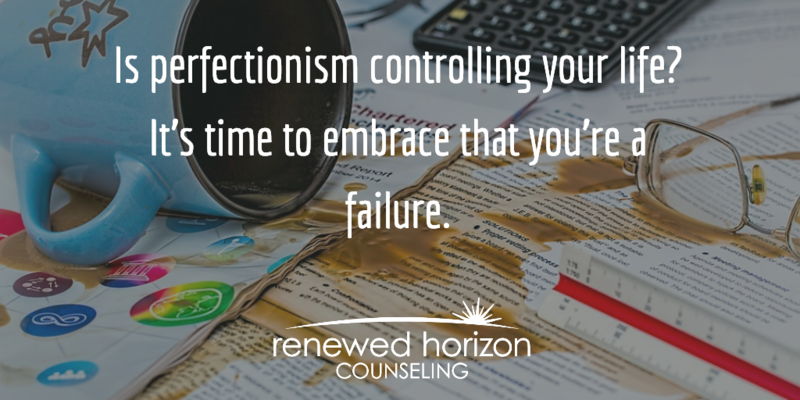 What areas of perfectionism are the hardest for you to break and accept your limits?